If your dog is suffering from halitosis, bleeding gums or obvious pain/discomfort then contact your vet for further investigation and treatment. Halitosis is far more than just a social problem, it can be a sign of kidney problems. Any lumps, bumps, boils or lesions on the inside of the mouth or around the lips also need to be checked out fully by your vet. Malocclusion is quite common in Spinone in that the lower canine teeth can dig into the gum line on the upper jaw. This can cause problems and may need correcting either through extraction or orthodontic braces. 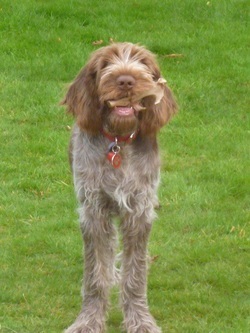 However, the Spinone puppy is a rapid grower and often given time these issues will correct themselves. Unless there is a real problem with fistulas and/or your dog is unable to chew properly, no action should be taken until at least 18 months of age when the majority of cases will have self-corrected. The best treatment for lip fold pyoderma is to keep the hair around the area trimmed right back and to keep the area as clean as possible,preferably with CLX cleansing wipes. If there is a particularly pronounced stench or the folds have pus in them, antibiotic treatment may be needed, certainly your vet will need to be consulted. To prevent lip fold pyoderma, use a cider vinegar solution to wash the beard with daily or a weak Hibiscrub solution. free. Your dog should always be supervised when chewing bones in case obstruction occurs. If you are not comfortable feeding raw bones, then pet stores stock a range of nylon bones which are a good alternative. Dog's teeth can be brushed but never use toothpaste designed for humans as the fluoride in it can cause gastric problems if ingested. Dog toothpaste is widely available in pet stores and is usually poultry or meat flavoured to make it more acceptable to your dog. If you choose not to brush your dog's teeth then be sure to make a point of examining their mouths at least once a week, in order to spot any potential problems. In the event that tartar build-up occurs, it can be easily removed by using your fingernail to scrape it away starting from the gumline. Fragaria is a homeopathic remedy for softening tartar.